How do you prove you’ve really got a breakthrough product? That’s the challenge Jeep faced back in 1992, when it launched the all-new Grand Cherokee. So, rather than simply lifting the covers at the annual North American International Auto Show, then-Chrysler President Bob Lutz drove a Jeep up the steep stone steps of Detroit’s Cobo Hall, and right through a plate glass window. It was an audacious debut — and a fitting one, for the original Grand Cherokee was visually striking and sophisticated, surprisingly well-mannered on the highway, and yet confidently capable off-road, as well. 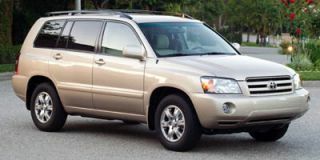 Perhaps no product did more to ignite the so-called crossover boom, as Americans raced to trade in their passenger cars for SUVs and other light trucks. Jeep has certainly benefited from this boom, yet it can be argued that in recent years, the Grand Cherokee has slipped a bit to the side of the mainstream. 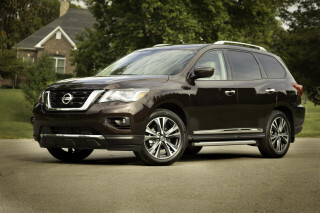 These days, sport-utility buyers seem increasingly divided into two camps: those who want traditional utes with three-row, minivan-like seating, and others looking for the even more car-like ride and handling of so-called crossover SUVs. So there was plenty of interest in seeing what DaimlerChrysler would come up with when it unveiled the third-generation Grand Cherokee earlier this year. The Jeep just getting ready to hit the road can best be described as an evolutionary, rather than revolutionary, update. 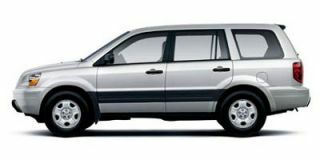 There’s a good chance that you might walk right by one in the parking lot and not even realize it’s the 2005 redesign. There’s the traditional, seven-slot Jeep grille, of course, and the basic silhouette is very much that of a Grand Cherokee. 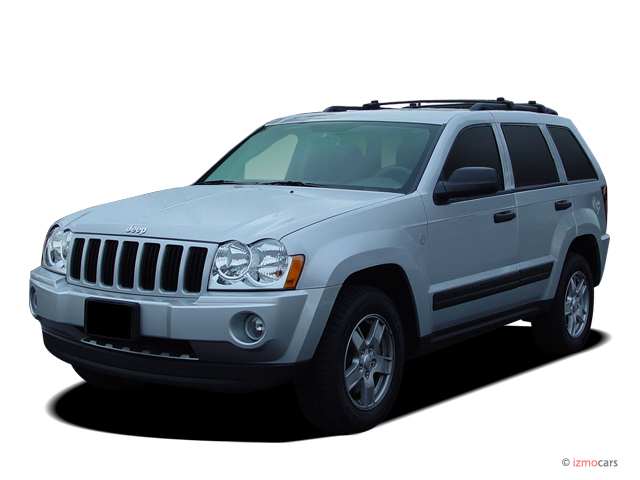 Yet a closer inspection reveals some notable differences from the ’04 model, starting with the rounded headlights borrowed from the popular Jeep Liberty. The latest incarnation of Jeep’s flagship SUV is a big longer, a slight bit wider, and a bit more boxy than the vehicle it replaces. The rear glass has been squared off and is much more upright than with the second-generation Grand Cherokee. 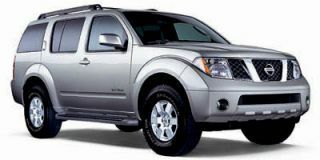 The practical purpose is to provide easier access to additional cargo space. The wheel openings are now a trapezoidal design. And there’s more chrome, but the use of the additional brightwork is quite classy. 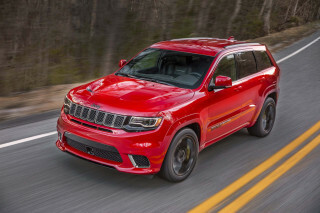 The hood is longer, noted designer John Sgalia, “to project the power we have in the HEMI engine.” The wildly popular, 5.7-liter V-8 is, in fact, one of three engines available for the ’05 Grand Cherokee, along with a 4.7-liter V-8 and a 3.7-liter V-6. And sources tell TheCarConnection that the new 6.1-liter version of the HEMI, making around 425 hp, will be added as an option in the 2006 model year. But we’re getting ahead of ourselves. The original, 1993 Grand Cherokee boasted an unexpectedly refined design, both inside and out, its interior as sophisticated as any vehicle in its price class. In keeping with overall market trends, the new Jeep’s cabin is more refined, though the various gray and black plastics are still not world-class. The instrument panel has been organized into a sort of double cockpit, with gauges well-placed before the driver, and climate and audio controls within easy reach on the center stack. In general, Jeep engineers have given some well-deserved attention to the tactile qualities of the Grand Cherokee’s switches and knobs. They just feel better. 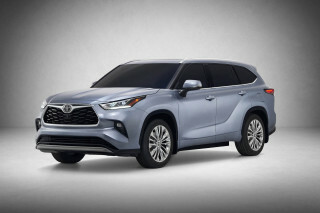 There’s an optional, new navigation system with a positively massive LCD display, and for rear seat passengers, a large, roof-mounted monitor for whiling away the miles watching DVDs. Perhaps the biggest initial surprise was Jeep’s decision not to add a third row of seats, in line with one of the SUV market’s biggest trends. But it was felt that would have required compromises in the ute’s off-roadability. 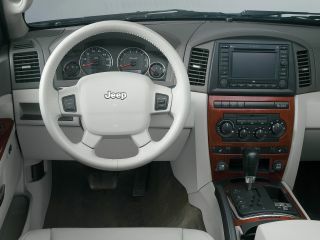 So those who need the extra seating will have to wait a while for the arrival of the all-new, three-row Jeep Commander. The ’05 Grand Cherokee’s seats have been re-engineered. Up front, they’re more comfortable and better looking, with their handsome two-tone trim. The rear seats have been given an extra two inches of travel. We wish we could say that’s enough. It’s not, though, and the back seats are the source of our biggest complaint about the new Jeep. The floor is so high that even average-sized passengers will find their thighs off the seat and knees in their face. Overall, that high floor limits headroom, so even though the interior is bigger, one can come away feeling a bit claustrophobic. Let’s get a few other complaints out of the way: in keeping with the low, almost hotrod-like look pioneered by the Chrysler 300, the windshield of the new Grand Cherokee is lower and more steeply raked, forcing you to crane a bit to see some stoplights. We were pleased that Jeep integrated adjustable pedals into the new SUV, but not at the expense of a telescoping steering wheel. At least it does tilt. 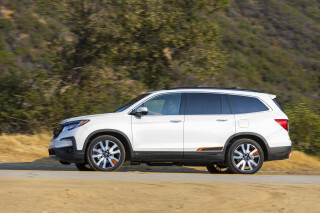 A point of debate was Jeep’s decision to make the new head-curtain airbag system an option, rather than following Honda’s lead and offering up as standard equipment. Expect at least 30 percent of Grand Cherokee buyers to cough up the cash — and it’s an expensive system. We wouldn’t be surprised if competitive pressures quickly force Jeep to make it standard, as well. Overall, engineers have paid a lot of attention to the subject of safety. 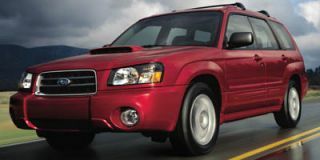 The ’05 has been tested beyond the minimum government specifications, the automaker boasts, handily surviving 40-mph front offset and 50-mph rear crash tests. There are plenty of car-like features, such as stability control and Jeep’s new Dynamic Handling System, though again, many of them are high-cost options. DHS is a hydraulically-controlled active stabilization system, designed to reduce body roll in tight maneuvers. 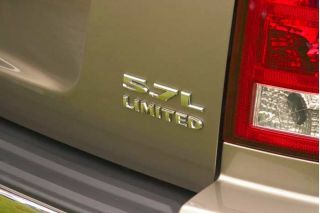 The system will debut late in the model-year, and will be available, at least initially, on the HEMI model only. With the new system, the HEMI comes as close as you could hope for to car-like handling. Even without DHS, we were impressed with the ride of the various versions of the Grand Cherokee that we tested during a day’s jaunt through the mountains east of Santa Barbara. 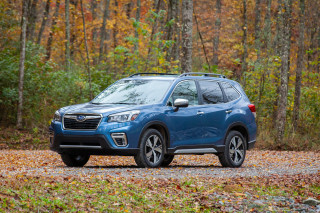 On reasonably smooth pavement, you definitely get the sport in this sport-utility vehicle, though the ride can get a bit bouncy, especially on the sort of whoop-de-doo freeway pavement common across California. Steering is precise and there’s a solid, on-center feel, which overcomes one of the most common complaints about the last-generation Grand Cherokee. Leave it to Jeep to come up with three new four-wheel-drive systems. The typical buyer is likely to opt for the full-time Quadra-Trac I package. For those who tow or do serious off-roading, there are the Quadra-Trac II and Quadra-Drive systems. We didn’t get to spend much time off-road in the new Jeep, but the brief course we followed would have fairly tested the mettle of anything on the road. Yet the new Grand Cherokee with Quadra-Trac II made it all easy going. Even on the loosest dirt and most humbling rock, our ute never seemed to lose its grip. And the HEMI V-8 powered over the steepest hills. If recent experience is any indication, we’ll expect a high “take rate” for the hip HEMI package. It’s certainly a lot of fun to drive. Stomp down on the accelerator and the engine emits a menacing roar as it launches down the road. But for those on a budget, the reality is that the 4.7-liter V-8 nearly matches its bigger cousin off the line, and it's likely to beat the meager 12 mpg colleague and TCC Editor Marty Padgett logged during a day in the HEMI model. There are going to be those disappointed by the new Grand Cherokee — those who might have expected Jeep to acknowledge the increasingly popular crossover side of the SUV segment, as well as those who would prefer still more seating. But the upcoming Jeep Commander will be there for those who need a seven-seater, and as TheCarConnection recently reported, Jeep is developing a lower-cost “soft-roader,” too. There are lots of others who will be pleased to see that Jeep has stayed true to its roots. And there’s no question that the 2005 Grand Cherokee is even more capable than ever — both on-road and off. It may not grab your attention the way the original did. 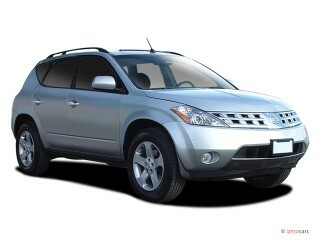 But it doesn’t have to smash through windows to prove that it can still set a benchmark for go-anywhere SUVs.